Well dressed on adventure with the Altitude motorcycle jacket. 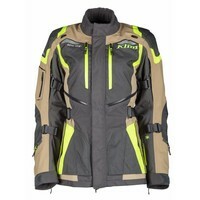 A jacket for the serious touring and all-road rider and ideal for motorcycles with a fairly straight sitting position. 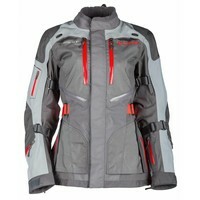 The design takes the feminine lines into account, which ensures a comfortable jacket with a beautiful fit. The Altitude is equipped with two layer Gore-Tex and is therefore windproof and waterproof yet breathable. The jacket has ventilation ports for hot days. The fit can be adjusted with adjustment straps at the waist and on the arms. The jacket is supple and lightweight, giving plenty of room for movement. For extended wear resistance Cordura is used on the shoulders and elbows. The jacket is equipped with high-quality D3O protectors. These flexible protectors feel comfortable to use and provide perfect protection when needed. The Altitude is equipped with 3M reflectors. The Hi-Vis version of the Altitude further contributes to improved visibility. The Altitude jacket is available in Black, Grey and Hi-Vis . 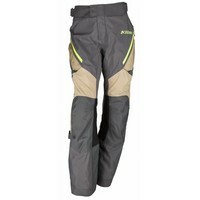 In addition a Altitude Pant is available in Black and Grey. 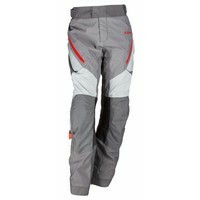 The pant is available in two size variations: Regular, and Tall.